Combining historical temple visits, with cultural immersion and urban exploration, the Colors of Cambodia tour is a perfect blend of Cambodia’s finest elements. Experience the country’s natural beauty along with the subtleties of Khmer culture on this journey from Phnom Penh to Siem Reap. Price from: $519 - Book now! Welcome to Phnom Penh, Cambodia’s vibrant and bustling capital city. Despite its recent turbulent history, Phnom Penh’s wide tree-lined boulevards and faded colonial mansions hold an undeniable charm. Upon arrival, Tour guide and driver of Cambodia Tours will meet you at the airport and take you to your hotel for check-in. Spend the day on a tour of Cambodia’s vibrant capital city. Start by learning about the Khmer Rouge and Cambodia’s recent, bloody history on a guided tour of the Tuol Sleng Genocide Museum and the notorious Choeung Ek “Killing Fields”. Lunch at a downtown restaurant, then conclude the day with a cyclo ride down Sihanouk Boulevard to visit the National Museum and the Royal Palace - home to the royal family and the opulent silver pagoda. End of day, visit the Central Market before return to hotel. After breakfast our driver will meet you at your hotel and take you on the 5 hour drive from Phnom Penh to Siem Reap. 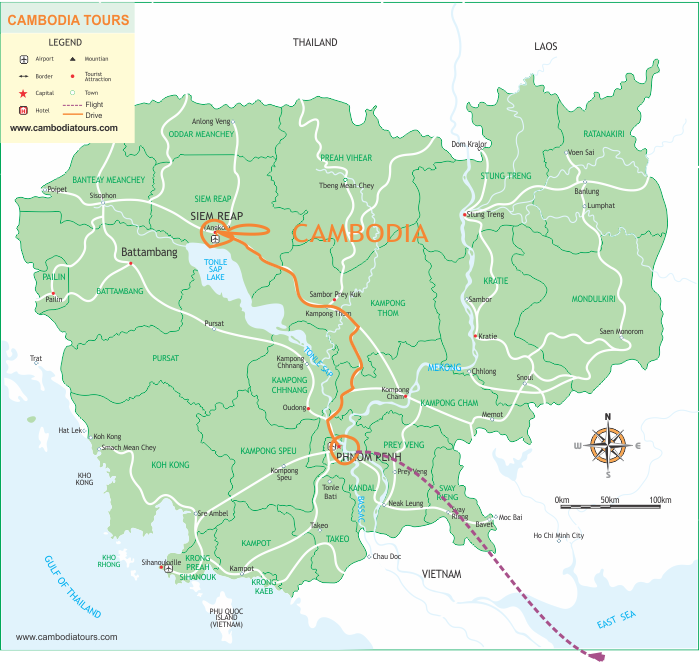 The journey offers an excellent opportunity to observe rural Cambodia up-close. Stop along the way and visit a market, where every assortment of street food is available, including the Khmer favorite: fried spiders! Once you arrive in Siem Reap, check-in to your hotel. In the afternoon, meet your guide and head out of town and embark on a short cruise along Tonle Sap Lake to visit the local floating villages until sunset. Enjoy an entire day dedicated to discovering the mysterious Angkor temples. Wake before dawn and take a “tuk-tuk” ride to visit the magnificent Angkor Wat - the largest Khmer temple and finest example of Angkorian art and architecture. After that return to hotel for breakfast then set back out on the tour to visit the jungle-entwined temple, Ta Prohm. From there we proceed to Angkor Thom’s imposing South Gate, topped with the four serenely smiling faces of Avalokiteshvara. Next, visit Bayon Temple, the Elephant Terrace and the Terrace of the Leper King. Discover the secrets of authentic Khmer cuisine in a half-day cooking class. Begin with a the walk and talk along local market where you will learn about Cambodian vegetables, herbs, and other ingredients before returning to the classroom for a hands-on culinary experience. After dining on your creations, Cambodia Tours arrange the visit to some of the oldest temples in the Angkor complex. An hour drive out of town to the ancient capital of King Indravarman I (877-889), now referred to as the Rolous Group and known as the birthplace of classical Khmer art and architecture. On the way back to Siem Reap, visit a Little Angels Orphanage and Khmer Art Center where you will learn about Khmer art of leather carving and shadow puppet. You will have chance to watch the shadow puppet performed by the children here if they are available. Enjoy breakfast at the hotel then set off to the tranquil countryside around Kulen Mountain, the Khmer Empire’s capital in the early 9th century. Here we will visit countless ancient temples, the River of 1000 Lingas, a reclining Buddha and cascading waterfall. After lunch drive to Banteay Srei, home to Angkor’s finest stone carvings, followed by Preah Khan (Sacred Sword): one of Angkor’s largest temples, constructed in the 12th century by Jayavarman VII. In the evening, enjoy the dinner and Apsara dance performace at local restaurant. After breakfast, you will be free until your transfer to the airport for departure. All hotels are rated according to local standards. All itineraries are flexible and can easily be altered to suit your needs and interests. Please contact one of our travel consultants for more information. Accommodation with daily breakfast at selected 3 star hotels. Services of a private driver and air-conditioned vehicles. Service of English speaking guides as mentioned in the itinerary. Entrance fees for all mentioned sights visited.